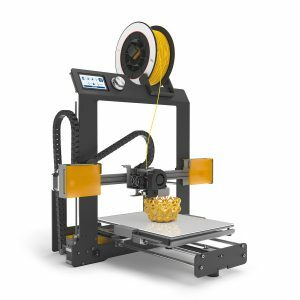 How does GCode for 3D printer work? The answer is the key to understand the language that runs some open source 3D printers. Historically GCode was a simple language, born at the MIT in the 1950’s, to manage movements on a CNC machine. Basically a 3D printer is a CNC that adds material instead of subtracting it (additive manufacturing). GCode, as all the languages, has a grammar to know. GCode is at the base of photo plotters that serve to etch printed circuits board (PCB) in electronics. This programming language has been standardized by the RS-274D. To fully understand how GCode works, it is better to explain, basically, how a 3D printer works. A 3D printer builds an object by melting a plastic filament. The object grows layer by layer. The extruder, that melts the filament, is like a pen that sticks fused plastic following lines calculated by a 3D design. 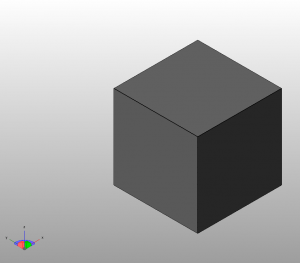 Starting from a designed cube, as example, we have to convert this 3D design into an “stl” file (stereolitography). The design will be converted in a mesh, many triangles that surround the external surface of the cube. Below you can find a rendering of a Mesh tessellation. You can see every face of the cube divided into two triangles. The three dimensional space coordinates describe each triangle. The 3D printer works like a 2D printer to build a layer. Many layers sticked together build our initial 3D designed cube. The GCode is the way to program the large amount of movements needed to “sketch” the 3D printed layers. To calculate every layer we have to use a special software called “slicer” that convert an “stl” file into a GCode file, specifically written for a 3D printer. 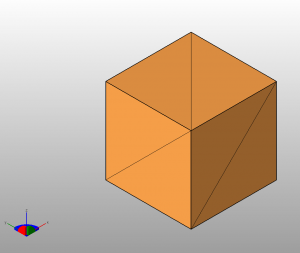 We can use a free slicing software like Repetier-Host to convert the 3D designed cube into a valid GCode. 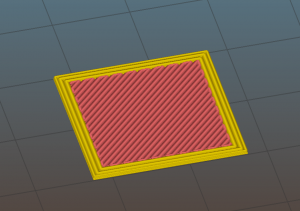 Below you can see one simulated printed layer inside a slicing software called Slic3r. 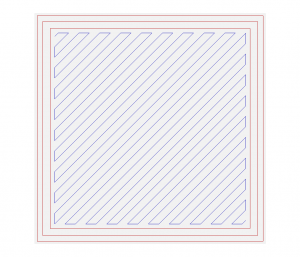 Hereafter the same layer represented as a 2D sketch. Please pay your attention to the lines that trace the movements of the extruder. If you run the GCode programming commands, inside an open source 3D printer running a firmware called “Marlin”, you will build a real plastic cube. You can see some GCode programming lines below. 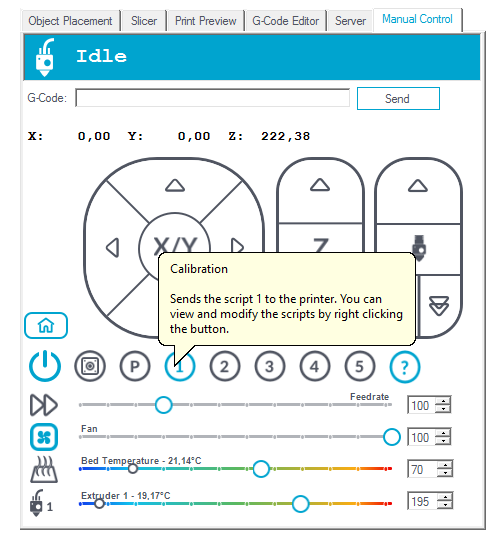 You can find a specific GCode language description inside the “Marlin” firmware, used to run a 3D printer. The GCode will be written as a plain text. It is made by a “command” and some data. A semicolon start a comment text. The command start with a letter followed by a number. short list of the GCode Marlin flavor language commands. You can find the whole command list to Marlin GCode. G91 ; set the movement as a shift positioning from the previous position. Relative movement. G92 ; set position. Reset the counter position to a new number. 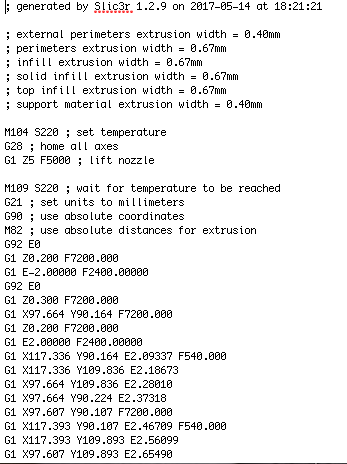 M109 S210; set extruder temperature to 210°C. Wait until target temperature has been reached. You can understand how calculate the width of an extruded segment at this link: Understanding flow math. This calculation define how much E <number> you have to set to print correctly. Arduino IDE is used to make the Marlin firmware. Repetier is used to slice a 3D stl file and send GCode commands, by serial communication, to 3D printers. is able to send generic commands from its build-in Serial Monitor (Instrument -> Serial Monitor). Set a valid BaudRate like 115200. Write a line filled by GCode commands and clic to “Send”. You should notice some change in your 3D printer. Clic to “Manual Control” to view and send Gcode commands. You can write any commands into the “G-Code” empty window. Clic to “Send” to send commands to your 3D printer.